A teenager’s home-made contraption proved the most eye-catching of the 1,500 bicycles which took to the new AWPR yesterday. Finley Cousins, 15, reckons he is the youngest person in the world to have made a “double-decker” bike. The Robert Gordon’s College pupil welded an old bicycle with another which a friend was planning to throw away, and took the invention on its most high-profile outing yesterday. 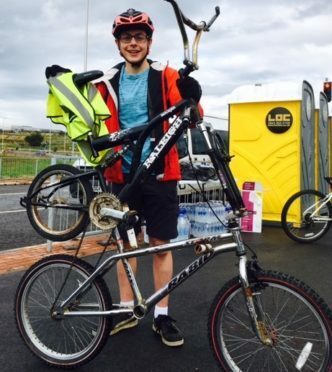 Finley was one of a sea of cyclists who pedalled off from Craibstone on an 11-mile loop of the new Aberdeen bypass for the Go North East “cycling experience”. He said afterwards: “I decided to weld the bikes together as a project during the Easter holidays, after seeing something similar online. The event was the first time that cyclists have been allowed on the Aberdeen bypass, and they will be prohibited from the road once it opens later this year. About a dozen members of the Stonehaven Cycling Club cycled in from the coastal town for the challenge – and then back again. Cove Bay stalwart, Gus MacDonald, 65, expressed his hope that the opening of the AWPR will encourage more older people to get on their bikes and use the local roads which will soon be less burdened by traffic. Turriff couple Ian and Lorraine Hendry, and Macduff pair David and Lindsay Innes, represented Deveron Cycle Club. Mr and Mrs Innes were so keen that they completed the circuit twice. One of the younger participants was Rosemount two-year-old Ethan Mackay, who tagged along on the back of his dad Malcolm’s bike. Mr Mackay cycled the route with seven friends and neighbours, and 12 children. All 1,500 places on the Go North East cycle experience had been booked up by the end of last week. 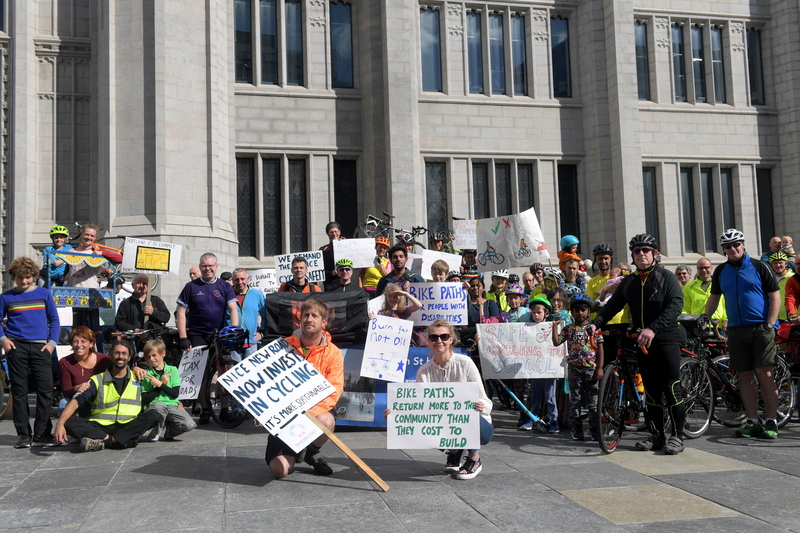 However, about 100 campaigners decided to their bikes to Aberdeen City Council’s Marischal College headquarters to protest the decision not to feature cycle lanes on the new road. The demonstration was organised by Aberdeen Cycle Forum, with many participants angrily brandishing placards. Charlie Barrow and Rachel Martin with protesters outside Marischal College. Nestrans director, Derick Murray, argued that the AWPR would open up a new world of possibilities for cyclists by freeing up space on existing roads which tend to be avoided due to high traffic volumes.